Batesville is the oldest existing city in the State of Arkansas. By a treaty of 1808 the Osage Indians ceded this territory to the U.S. and unlike most of the territory of Arkansas, it was never again returned to Indian control. However, the territory just south of the river was held by the Cherokee Indians from 1808 to 1817. The City has existed under three names: Napoleon, Poke Creek, and finally Batesville in honor of Judge James Woodson Bates, the first Territorial Delegate to Congress. He came to Batesville in 1819 and was one of the most prominent citizens of the community for fifteen years. His brother, Honorable Edward Bates of St. Louis, was Attorney General under President Lincoln. The Bates brothers originally came from Virginia. The town of Batesville was partially laid out in 1821 and on May 23, 1821, land was granted by Richard Searcy, Thomas Curran and Joseph Hardin to Mark Bean. 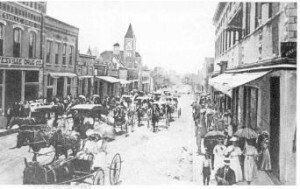 The above named grantors, on the 3rd of March 1822 executed and recorded a bill of assurance and a plat of the town was than laid out, extending from Block number one at the foot of Main Street to Spring Street, which is now Central, thence, to the bridge across Polk Bayou. The principal trade of Batesville during its early existence was that of supplying the settlers with groceries and provisions, for which hides and furs from the numerous wild animals of that time were taken in exchange. Batesville became the county seat in 1821 and on November 19, 1821 the first court of common pleas was held, Judge Richard Peel and William Moore presiding. This seems to have been the last court of this nature for in January 1822 Honorable Richard Searcy opened the first circuit court. This was the only court until on April 29, 1830. This first county court was held by James Boswell. The first post office was established here in 1822 with Nathan Cooke as postmaster. Colonel Boswell was made postmaster in 1827. Aaron W. Lyon came to Batesville in 1833 and engaged in teaching for some years but entered the mercantile business in 1842. Mr. Lyon was one of the trustees of the Batesville Academy, the first academy incorporated in the state, the bill for which was approved by Governor Conway on September 26, 1836. Batesville is now a city of over 10,000 citizens. Its growth is attributed to its natural resources such as water, climate, location, minerals and timber. The area’s economy is well diversified among industry, agriculture and tourism. Just as the early settlers needed water for navigation, food, and drinking purposes, so has Batesville given credit to the beautiful White River as our most important natural resource.